Athol Bennett of Bedford, known to friends and family as Bud, passed away Tuesday evening at his residence at the age of 84. Born in in 1925 in Bedford to Rex and Lucy Bennett, Bud was a World War II veteran serving with the US Army and a member of the VFW post of Oolitic. He is survived by his sons Nick and Doug, daughter Julie, sisters Nina, Vivian and Alice, brothers Wayne and Mick, a granddaughter, and two great grandchildren. He is preceded in death by his parents, wife Juanita, sisters Gayle, Mary and Dorothy, and a grandson. 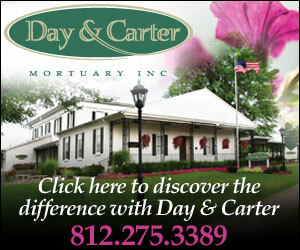 Funeral services will be held Saturday at Day and Carter at 10 am with burial to follow at Green Hill Cemetery. Visitation will be from 4-8pm on Friday at the funeral home.